Block ads and whatever you want. 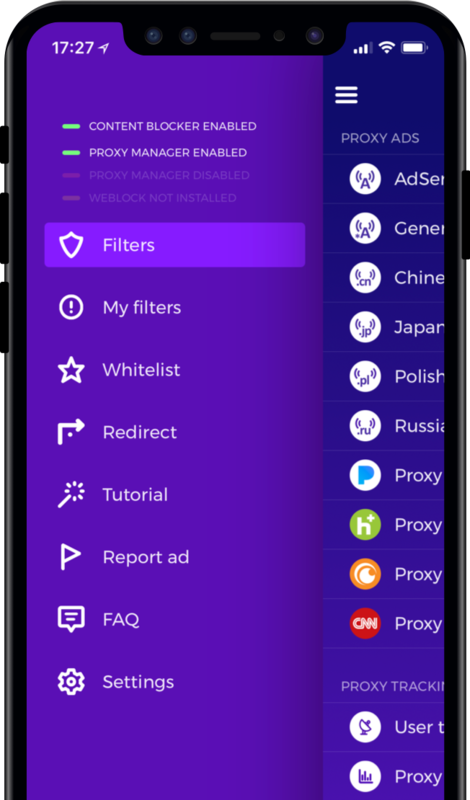 Weblock app allows you to block various types of online content while you are connected to Wi-Fi (on Android and iOS) or cellular network (on iOS). Block advertising – banners, pop-ups and video ads in most browsers and apps. Block unwanted content providers such as Disqus, Gravatar, Outbrain, ZergNet and others. Block tracking and statistical scripts to protect your privacy. Manage proxy settings with ease. 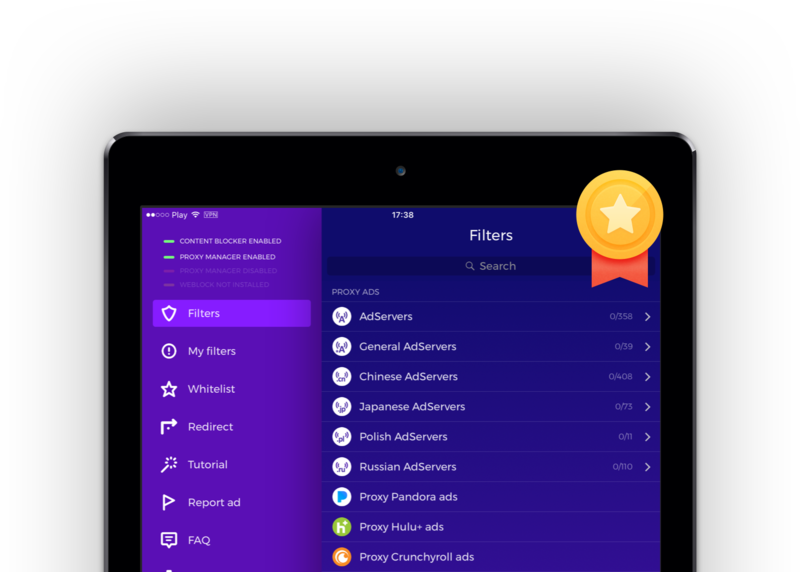 Choose from our predefined list which adservers and content providers you want to block on your iOS device. Import rules from EasyList or hosts file on your Android device. Create your own blacklist and whitelist to block any URL, domain or IP on both platforms. between your iOS devices via iCloud. between Android devices using export feature. by over 800,000 users worldwide. By far the best ad-blocking solution I've found for non-modified iOS devices. So much better than using some unreliable DNS server. A godsend for my iPad 1, where Safari would crash all the time on pages with too many ads and scripts for its limited memory. Now I can flip Weblock on if I'm going to one of those difficult sites, and browse their pages without having to deal with the spinner running for 3 or 4 minutes and Safari suddenly closing. As soon as I'm done with the "impossible" pages I can flip Weblock off again, which means pages that use ads responsibly don't have their revenue source blocked. Seems to work flawlessly, and the whitelist and blacklist options allow for fine-grained control. I recommend it. This blocker works on some of the worst energy-sucking ads out there. It also allows you to let some adverts through so your favorite sites get your support. Best of all, you can block the "trial" apps from causing Banner Ad Blindness before you can determine they are worth buying. Concise instructions and helpful tips give you confidence (not confusion) during the quick set-up stage. Great work by all involved! Simple to set up, and works perfectly. Blocks all ads in browsers (great because ios safari does not support extensions/plugins), and can block in-app ads as well. Also has options to stop websites tracking you, and can even block some Facebook/YouTube ads. In browser, pages load slightly faster as there are no ads to load, and there are no pups or banners anywhere. Most useful app I've ever bought. I was so sick of ads taking up screen space. This thing nails most of them. I didn't intending on paying £600 for a phone that tries to sell me something every 2 seconds. Big thanks to the devs for a solution that really should be implemented by apple for all! As the title says. Didn't believe it at first but once I properly set it up, it got rid of all the annoying popups and ads that's been eating away my precious screen. Weblock is available on iOS and Android.